Awesome! Will absolutely be grabbing this guy at SDCC! I'm not a stickler for who wore what in which game when it comes to MK- so having him in a classic costume is just fine by me. Nice display. I don't mind either, but wanted to mention it as complaints about that dominated talk on our Twitter page when he was initially revealed. Give me the full rainbow of Ninjas, and then do the same with the Cyborg Ninjas! Goddammit if he comes with those ripped off arm pieces I'm in after I swore not to buy anymore until we got non-ninjas. I like Storm's stuff but I feel like they took on too many licenses to do them all right. Noob wound up on BBTS last year for not a bad price compared to eBay of the SDCC, so I'll look for Ermac there later. Doesn't this series have at least one character who isn't a lazy Scorpion recolor? Even Transformers's second trio of Planes were modified with whole new wings and an alternate transformation. This is just red Scorpion. Almost ... ALMOST ... tempted to come back to the line, but I've quit Storm Collectibles. I love Mortal Kombat, but I ordered the first two, and the recommended vendor folded and I lost my $$$. Had to buy them on amazon for $$$. Then, my preorder for Reptile from a different company went rogue, and I lost $49 on that, too. With their scatterbrained release dates (shipping direct out of the blue, then waiting 4 to 6 months to send out the retail releases), they pushed me out. Shame. Really love Ermac, too. A place I ordered Reptile from on-line folded. Thankfully I purchased using Amex so they refunded it... I stick to BBTS for ordering anything Storm Collectibles now- but it is super crappy that they ship direct first and then just take their time sending out to their distributes... If I didn't love the toys they're making so much I would totally dump anything they do. But I LOVE these figures. While I do like this figure, I dislike how they used the original MK1/2 ninja outfit for Ermac. Ermac's debut was UMK3, and in the MK3 series, the ninjas have a slightly different but noticeable outfit. Possibly why he is a con exclusive rather than a standard release. I'd say they'll eventually do MK3 style ninjas but at the current rate that's at least a decade away. These are based not on mk1 or mk2, but rather the Mortal Kombat X Klassic Kostume. There are little differences that point this out rather distinctly. 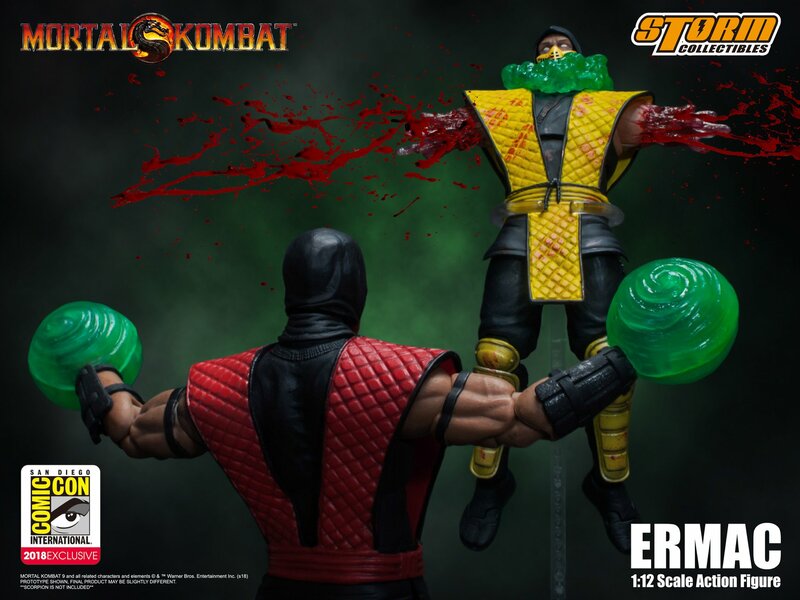 First of all, I'm don't mind with this tactic (Ermac for SDCC Exclusive) as they have their right to do that. BUT, I had to say that I'm kinda boring with Storm Collectibles now. They keep acquire many licenses as their product's progress is too slow for that. I don't know what's the point that they keep acquire many licenses if they couldn't manufacture many figures in a year. Another problem is the shipping delay issue which is quite frustrating. Also, their QC issue is worrying for me. I got their Reptile and it's peg is easily comes off when I attempted to change palm. I think I need to reconsider whether should continue to collect SC or not. I really love their MK line. But for these issue I had to think again. Last edited by Oliver Tan; 06-11-2018 at 06:07 PM..
and Figures general this Year 2018. I mean... WHAT THE FU** happened? Square Enix does not show any Play Arts Kai or rarely Bring Arts. Storm Collectibles has also remained Silent. grey Prototype a Year ago, or their Liu Kang Figure with Dragon. "I mean, what happened, Did you Balls drop off?" It is something like that. most of their Figures are sold out, or are a Top Seller. are Mezco and Mafex this Year, one announcement after another. I expect Square Enix and Storm Collectibles to do the same. Their Progress is FAR TO SLOW to actually make some serious Money with that Delays. Last edited by Ventus; 06-11-2018 at 06:45 PM..
Sure. There are dozens upon dozens of characters in Mortal Kombat that are not palette swap ninjas. There's Quan Chin and Jax, ummm...Sonya, Lui Kang, Giro, Shang Tsung...well...you get the point. If you ask any fan of the series however, they are likely to have at least one of these rainbow colored ninjas as one of their top 3 favorite characters. I really don't get all of the hate for this being in the MK 1/2 outfit. While I gets that his first appearance as a playable character was in UMK3, this figure actually pays homage to his first actual appearance, which was as a doctored Polaroid that ran in EGM magazine back in the day. It kickstarted the urban legend to the character, as well as a mad frenzy in arcades all over the world to find him...with the hilarious conclusion being that like another arcade urban legend that EGM fueled, Sheng Long...he never actually existed. figures should include some sort of bloody splatter piece! Got no Response, but they have read my Message. Last edited by Ventus; 06-12-2018 at 04:57 PM..
Where's the Liu Kang Figure with Dragon and where's Goro? We need those! And also MK & MK2; Raiden, Sonya Blade, Johnny Cage, Kitana, Jade, Mileena, Shang Tsung, Baraka, Kano, Kintaro, Kung Lao, Jackson "Jax" Briggs! Rainbow Power Rangers, Rainbow Deadpools, and Rainbow Ninjas! Whats next, Rainbow Bright? Write Storm C at Facebook or Email. I already did, and asked for Liu Kang and Goro. Repaints over and over and over again. that want more MK Figures. over and over again, is not a way to success. But other Characters will be. I mean what happens if all Ninjas are done???? If every MK1 Ninja like Ermac and so on, is finished??? Not creating anymore Characters, because everyone owns the Ninjas now? These Ninjas in their MK1 Outfits are the Worst ones in my Opinion. (A little bit more Knight Style like Scorpion) A LOT MORE. since no Company did these before. Last edited by Ventus; 06-14-2018 at 07:22 PM.. If I didn't love the toys they're making so much I would totally dump anything they do. But I LOVE these figures. I grow weary of these ninjas (heh)..i didnt' even purchase any except for Smoke. I just felt like down the line they will make a proper subzero, scorpion etc..and i wouldnt' need these versions. yeah they are cool but..come one..lets get this rolling. the only line diverse to this point is street fighter with what...like 7 to 8 figures released already. Shao Khan is out in Japan as well. I would like to know what they are afraid of. Maybe they have Fear that other Characters Sales will not be good? Hanzo Hasashi Scorpion unmasked MK10 Version. Or a Kabal Figure with removable Mask / Burned Face underneath. Actually EVERY Company Jazswares and Mezco messed up their MK Licenses so far. Because they never dared to produce other Characters than Scorpion and Sub Zero. Mezco Sub Zero and Scorpion were awesome Figures, i still own them. Jaszwares cancelled their Line Years ago, Figures were really good, but not really screen accurate. Last edited by Ventus; 06-15-2018 at 07:01 AM.. I think you misunderstand how stuff like this works. They keep making the Ninjas as they're a wildly popular series of characters, they sell well, and it helps them get the most out of their tooling. By spreading the cost of tooling over multiple releases, it allows them to invest in future tooling, especially for characters that have limited re-use options such as Goro and Shao Kahn.